State weather expert earlier said that tropical storm Nina (international codename Prapiroon) is now inside Philippine Area of Responsibility (PAR) as of 10:00 a.m. advisory. They expected tropical storm Nina to intensified in to typhoon. PAGASA forecaster Jori Loiz said in dzBB radio, "Magtatagal siya rito sa PAR. Inaasahan natin lalabas siya sa Sunday. Inaasahan natin lalakas ito, magiging typhoon ito." According to PAGASA weather bulletin as of 5:00 a.m., "Tropical Storm "PRAPIROON" (local name NINA) was estimated based on satellite and surface data at 1,320 km East of Tuguegarao City (17.8°N, 135.8°E) with maximum winds of 65 kph near the center and gustiness of up to 80 kph. It is forecast to move West at 15 kph. Intertropical Convergence Zone (ITCZ) affecting Palawan and Mindanao. " 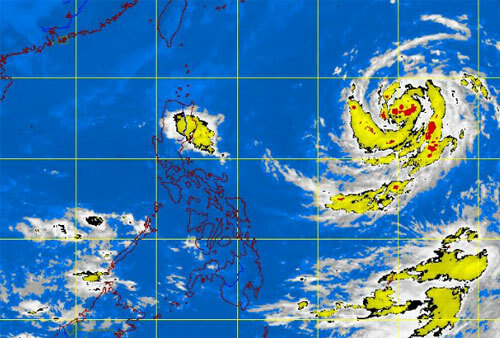 PAGASA said, "He said the storm is likely to exit the Philippine Area of Responsibility Sunday via the northeast border." Meanwhile, Palawan and Visayas will have occasional light to moderate rains or thunderstorms due to the Intertropical Convergence Zone (ITCZ), according to PAGASA. Comments or suggestions about "Bagyong Nina Update October 8, 2012" is important to us, you may share it by using the comment box below.